In all fairness, this should be called Almond Cheesecake Filling. It was a bit awkward how it all turned out. 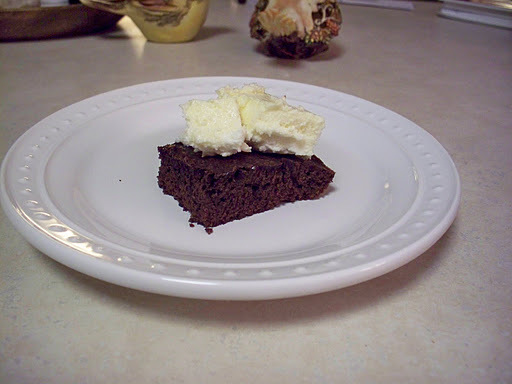 A while back, I saw this recipe called Decadent Chocolate Layer Cake in Cooking with Paula Deen. It’s two layers of chocolate cake with a layer of almond cheesecake in between, with chocolate frosting. You’ll notice that it looks AMAZING. However I’ve been trying to eat better, and although I don’t deny myself dessert if I want it, I was still fairly sure I should never make that. It sounds like it could kill you after a few bites. So I had another thought. What if I saved the filling recipe and the cake recipe separately and just made them as separate cakes? The verdict? They were okay. I think the biggest problem is that I don’t like cheesecake, but I do like cheesecake brownies. So, I definitely believe that if you swirled this batter into brownie batter before baking it, fantastic things could happen. Maybe someday I’ll try it, because this recipe is actually really easy to make. Preheat oven to 300°. Line a 9-inch round baking pan with aluminum foil, letting edges of foil extend over sides of pan. Lightly grease foil. In a large bowl, beat cream cheese at medium speed with an electric mixer until creamy. Add sugar, beating until smooth. Add eggs, one at a time, beating well after each addition. Stir in sour cream and liqueur. Pour batter into prepared pan; bake 45 minutes. 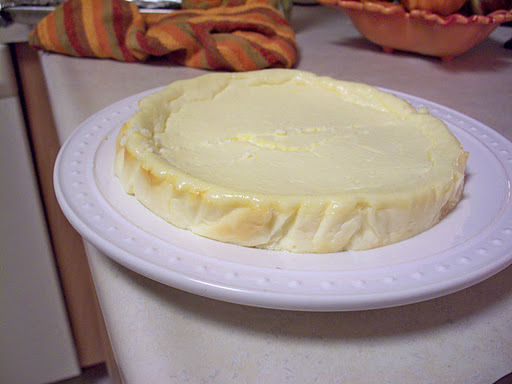 Turn oven off; leave cheesecake in oven with door closed for 1 hour. This entry was posted in Uncategorized on October 2, 2011 by michelejames. This is just a quick PSA about potentially one of the tastiest things I’ve ever cooked. Pork burgers. Travis was skeptical at first, but in the end he was a believer. 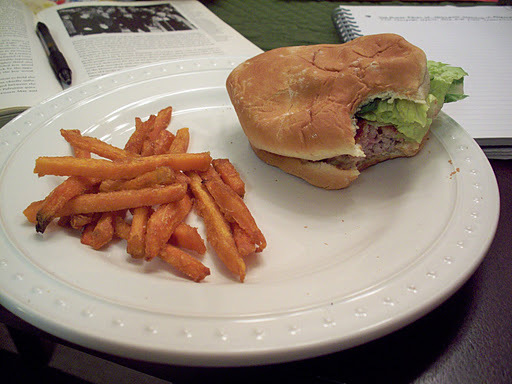 The recipe (Perfect Pork Burgers) came out of Food Network Magazine but can apparently also be found on their website. It’s really easy. Basically you just grind some bacon and garlic in a food processor, mix it with ground pork, season, make into patties, grill (or broil), and serve on some toasted potato buns (brushed with a little butter, of course). Amazing. The key, of course, is the bacon. Just try it. And now, back to my regularly scheduled massive amount of schoolwork that needs to be done. 1. Pulse the bacon and garlic in a food processor until coarsely ground. 2. Combine the ground pork, 1 teaspoon salt, 1/4 teaspoon pepper and the sage in a large bowl. Add the bacon mixture and gently mix with your hands. Gently form the meat into 4 balls, then lightly press into 4-inch-wide 1-inch-thick patties. Make a 2-inch wide indentation in the center of each with your thumb to prevent the burgers from bulging when grilled. 3. Preheat a grill to medium high. Season the patties with pepper. Grill, undisturbed, until marked on the bottom, 5-6 minutes. Turn and grill until the other side is marked and the patties feel firm, 4-6 more minutes. Meanwhile, spread the cut sides of the buns with butter and toast on the grill. 4. Serve the patties on the buns.